Even in his 70s, golf legend Sam Snead amazed the watching crowds by standing upright and kicking one of his legs over his head. Snead’s suppleness supported one of the longest, most fluid swings in the game’s history. Snead was naturally gifted, with loose joints and elastic muscles – but you too can loosen and lengthen your swing with a golf stretching routine. Improved flexibility will pay off with a more powerful swing and fewer golf-related aches and pains. You will enjoy the greatest gains in flexibility if you stretch four or five times a week for about 15 minutes, before you play and on your off days. You should always warm up your body before you begin to stretch. Five to 15 minutes of light aerobic exercise will increase blood flow to your muscles and prepare them for stretching. Without this warm-up period, not only will you find stretching in difficult, but also you will risk pulling and tearing muscles. Take a walk, jog on the spot or dance around a little before you start to stretch. Tight hamstrings — the muscles in the back of your legs — will prevent you from creating proper posture at address, and maintaining good posture throughout your swing. To loosen your hamstrings, sit on the edge of a bench with one leg hanging over the edge and the other leg extended along the length of the bench. You may feel a little pull in the back of your leg when you assume this position. If not, lean slowly over the straight leg until you experience a gentle pull. Hold the stretch for 15 seconds. Repeat five times. The bending and twisting in your swing can leave you with tight lower-back muscles. To loosen them up, drop to the floor on your hands and knees for the cat/cow stretch. Look down at the floor to keep your neck in a neutral position. Arch your back toward the ceiling and hold for 20 to 30 seconds, then flatten your back and hold for 20 to 30 seconds. Perform this stretch twice. To keep muscles in the side of your torso supple, stand straight with feet hip-width apart. Lift one arm straight overhead and lean your upper body away from the straight arm. You should feel a stretch through your side. Hold for 30 seconds and repeat on the other side. In your golf swing, your arms need to be able to move freely across your upper torso, which requires flexibility through your chest and shoulders. To loosen up your pectoral muscles in the chest, stand in an open doorway. Extend your arms out to your sides so you hold onto the door jam or wall on either side of the door. Lean forward as far as you can. Hold the stretch for 20 seconds. To loosen your shoulders and rotator cuff, grab a club in the center of the shaft with one hand and hold the club out in front of you. Slowly rotate the club from a palms up to a palms down position 10 times, then repeat with your other arm. Karen qualified as a Chartered Physiotherapist from Newcastle School of Physiotherapy in 1979, and after working in the NHS for a couple of years she travelled and worked abroad, both in Australia and the Middle East, in Saudi Arabia and Qatar. 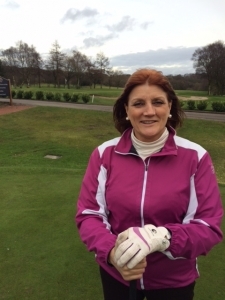 Karen has played golf ever since she met her husband Mike, a single figure handicap golfer (she thought ‘‘if you can’t beat ‘em, join ‘em!’’ but hasn’t yet managed to reach her ambition of a sub-20 handicap. Karen’s belief is that most amateur club golfers could shave 5-10 shots off their game by getting a bit fitter and stronger with the right advice from a golfing physio.